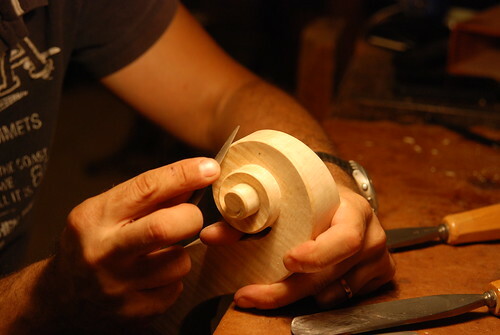 As promised last time, I am moving backwards in time from the "incastro" phase… to describe one of my favorite steps in the violin making process – the scroll, which in Italian is called "chiocciola", (pronounced kyo-cho-la)meaning "snail". This is maybe the most obviously impractical part of the stringed instruments – it has nothing to do with the instrument's strength, sound or playability. 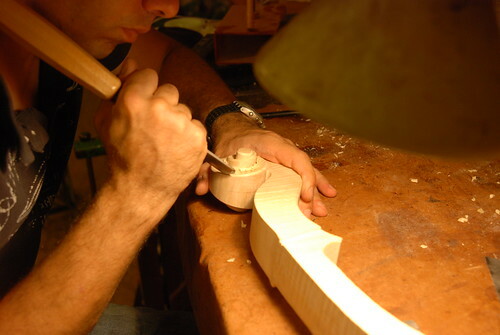 However, in addition to becoming one of the violin's trademarks, the scroll is the place where the violin maker can really express her or himself. I'm sure that for most of you, like for me, most of those curly "snails" at the end of the instruments' neck look about the same. Oh how wrong you are! 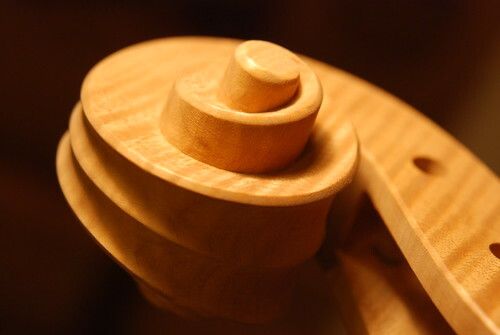 There are endless intricacies, variations, proportional differences and three-dimensional improvisations that go way beyond what we mortals are able to see – scrolls can be delicate or heavy, protruding or relatively flat, with a big or small "eye" (center), flowing downwards or upwards…. 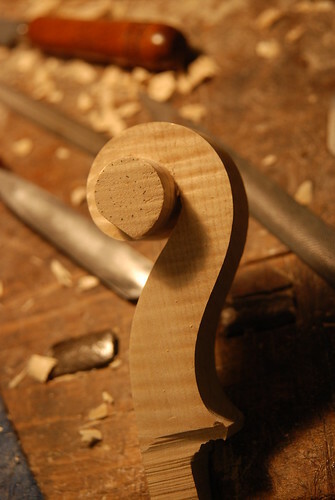 And these oh-so-subtle differences make the scrolls of each violin maker uniquely his. 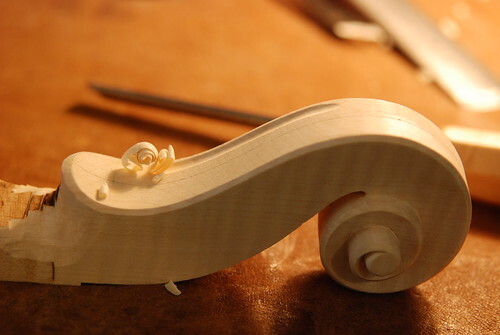 Not only that – the scrolls are one of the places that experts in violin evaluation look to decide whether this particular instrument is, in fact, a really valuable antique or whether it's just the old, used instrument you happened to find in your grandparents' attic, and wildly hopes that maybe, just maybe, you had stumbled across a long-lost Stradivari…. I love your blog, but this entry really felt magical. Thanks for the description, and the wonderful photos. Thank you, Avivot. 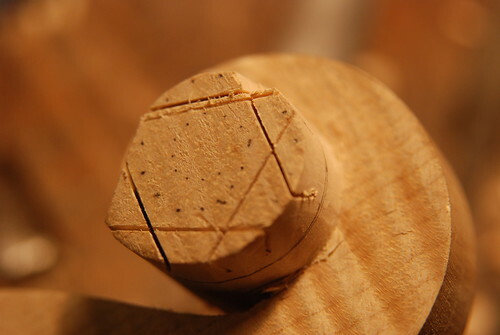 I have seen many pictures of scrolls in various stages but it always seemed to me that too much wood was being cut out at the sides. Your pictures taken from different angles are perfect. And I don't know why, but I was always reading "chiocolotta" as "cioccolata" and your adjectives did sound like descriptions of chocolate! 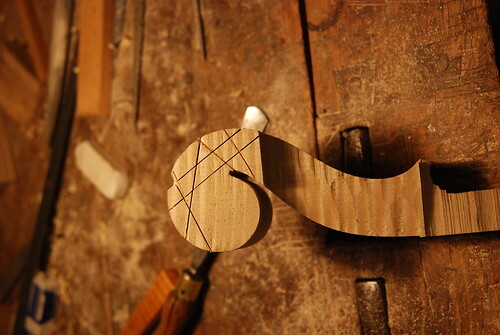 And I'm curious about how the design of a cello scroll differs from that of a violin scroll. 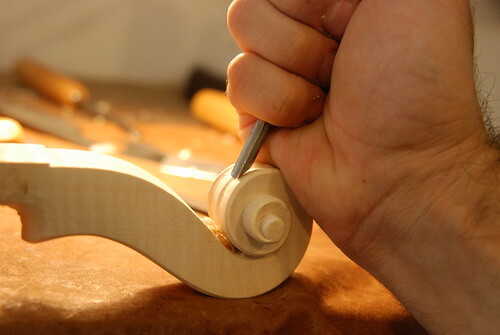 Are you planning to photo-document the creation of the cello scroll, also? 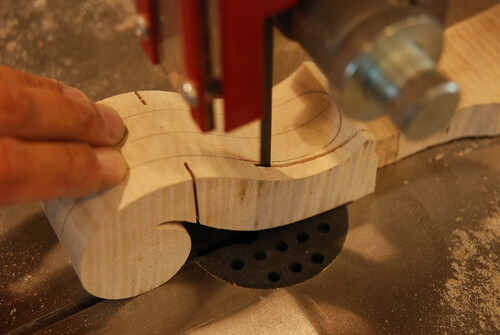 the scroll just before the chisel work began. Does Yonatan use a template that he drew? thanks everyone for the warm comments and compliments! Fran - the pictures are actually a combination of scrolls taken from the cello and the viola ... while the proportions of the entire neck are different, in pictures that are so up close you're right that it's hard to tell which is which. and about the pencil lines you mentioned, yes, each instrument model has a template of the scroll, which gives guidelines for its shape. Really enjoy following your blog on this subject. 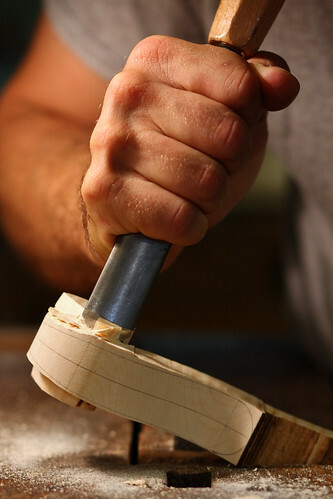 It's nice to be able to learn more about what goes into creating these instruments.